The Gadchiroli police in the late hours of January 30, 2019, took custody of noted human rights lawyer and Nagpur-based Dalit rights activist Surendra Gadling and activist-poet-writer P Varvara Rao from Pune’s Yerwada Jail authorities. The Police made the arrests in connection with another alleged case of involvement of Gadling and Rao in so-called “unlawful activity” related to the Surjagadh case of 2016. Gadchiroli police in the late hours of January 30, 2019, took custody of noted human rights lawyer and Nagpur-based Dalit rights activist Surendra Gadling and activist-poet-writer P Varvara Rao from Pune’s Yerwada Jail authorities. The Police made the arrests in connection with another alleged case of involvement of Gadling and Rao in so-called “unlawful activity” related to the Surjagadh case of 2016. Surendra Gadling has been involved in various human rights cases defending the poorest of people unfairly targeted by the State, while P Varavara Rao, renowned activist, renowned poet, journalist, literary critic, and public speaker from Telangana, India, has been targeted by the police yet again, in charges under that illustrate why preventive detention laws have no place in a democratic republic such as India. Gadling and Rao were lodged in Yerawada jail following their alleged connection in Elgar Parishad Case. A senior police officer associated with the Elgar probe confirmed the development and said that after the Pune court allowed the plea of the Gadchiroli police who approached the special UAPA court in Pune with a transfer warrant issued by the special UAPA court in Gadchiroli for producing Gadling and Rao in connection with alleged Surjagadh case. The Gadchiroli police has taken Rao and Gadling to Nagpur, where they will be produced in court in some time. The arrests were made under the draconian Unlawful Activities (Prevention) Act, 1967 (UAPA Act) which this government is using as a choice weapon against freethinkers and dissenters. The UAPA Act has ambiguous substantive provisions and draconian procedural provisions which allow the State to keep people in custody for extended periods of time without Bail, which is a fundamental right of the people of this country. 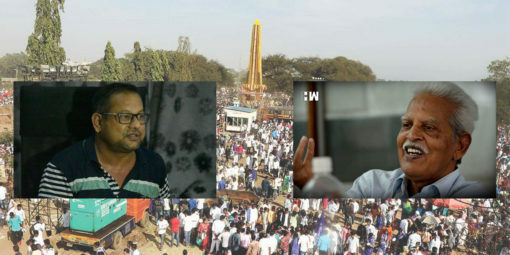 While the Supreme Court is yet to deliver the Bhima Koregaon judgment, the Bombay High Court had rejected the Maharashtra police’s demand for more time to investigate the charges against the nine arrestees, including Gadling and Rao. But the Supreme Court had stayed the Bombay HC order on October 29, 2018. Evidently, the State is repeatedly victimising the human rights activists and dissidents on fabricated facts and for the fictitious links, while judiciary is hiding behind unacceptable delays in pronouncing the judgment and giving the necessary relief to these eminent citizens who work tirelessly for the downtrodden of the country. The inexcusable delay in pronouncing the judgment is happening despite the fact that lawyers for Gadling et al had pointed out in court that any deferral would give the State and the law enforcement agencies to abuse rule of law and engage in “ever-greening of charges”, which is precisely what is happening now. The end of the brutal theatre of state-sponsored strafe and hunting of civil liberties and human rights activists in not in light even at the end of the tunnel. The Courts of this country instead of sitting tight on the judgments should wake up and come forward in restoring the justice.